A partnership between restaurateur Charlie Palmer and winemaker Clay Mauritson of Mauritson Winery in Dry Creek Valley. The pair were traveling with friends to the Hospice du Beaune in 2005. Inspired by the 2005 vintage in Burgundy, Charlie Palmer decided he wanted to make Pinot Noir. Palmer owns a 2-acre Pinot Noir vineyard on his estate property planted in 2006, but sources most of the grapes used in the Charlie Clay wines. The 2006 vintage was the inaugural vintage of Charlie Clay wines. 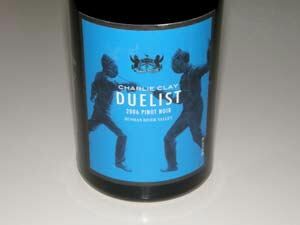 The Duelist is a reserve bottling sourced from Dutton-Campbell Vineyard and Bacigalupi Vineyard. The wine is found on the wine list at Charlie Palmer's restaurants.